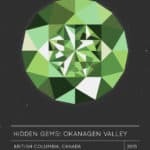 Today’s Hidden Gems guide comes from Cadence Woodland of Small Dog Syndrome! 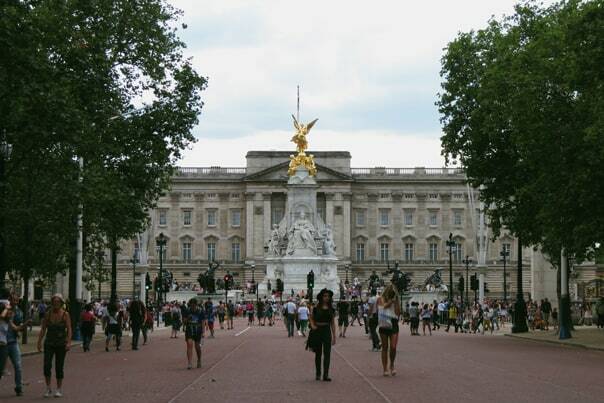 Check out this amazing London travel guide! 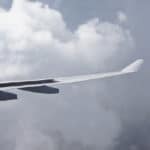 I grew up bouncing around all over the world as a military brat, married a civilian, and convinced him to come globetrotting with me. We moved to London in 2013 and have been exploring (and munching our way through) the city ever since. London is a fabulously international city. It’s estimated that over half of the population aren’t even British much less native Londoners. It’s a crossroad between Europe and North America, and one of the world’s major hubs to Africa, the Middle East and the Far East. Meaning that everything here from the fashion, to the architecture, to the food is a glorious mix of influences. Underlying everything, however, is a solidly British sensibility: charming, humorous, and clever. There’s an amazing sense of history everywhere you go and you can pretty much guarantee that if you turn down any street, you’ll find something interesting to look at, buy, eat or learn. I’ve lived all over the world, but nowhere has felt like home to me as much as London. 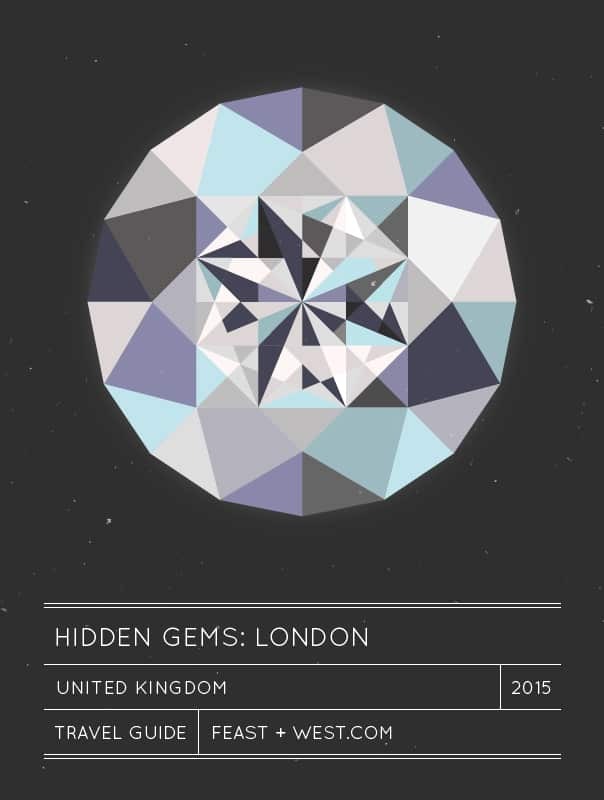 Click below to see Cadence’s London hidden gems! I’m a pretty unabashed omnivore, and I have to admit I love red meat. BRGR.CO — Easily the best burger I’ve found in London (Believe me, I take the search for one seriously) and surprisingly cheap-ish! Start by choosing your cut of meat and then customise as you see fit. I heartily recommend the caramelized onions with Gruyère cheese. 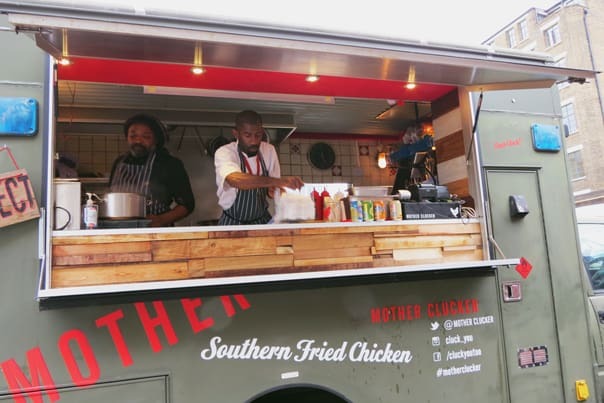 Mother Clucker — A cheekily named food truck that serves some truly succulent fried chicken. Usually to be found between two excellent markets, apparently they are also setting up shop in Camden, keep an eye on their (equally cheeky) social media for updates. Monty’s Deil — A “Jewish soul food” sandwich joint only found on the weekends at the Maltby Street Market on the south side of the river — my usual stomping grounds. Everything is handmade, including the pastrami (which is next to impossible to find in Britain, at least the genuine article). MEATliquor — A grungy, in the best possible way, punk joint that boasts burgers and booze. Obviously! Decent burgers, but the real indulgence are the milkshakes mixed with bourbon, Kahlua and other punchy mix-ins. Also there is a “house grog” that is not only delicious, but sounds pirate-y in the best possible way. Fair warning, there is always a line! Bleecker St. Burger — Last burger, I promise (what can I say, I’m a Yank girl at heart!). Another food truck worth knowing, especially for their Rage Fries, positively dripping with hot sauce. Not on the normal menu, ask for them anyway. Little Bird Gin — London’s traditional drink is unquestionably gin. From gentleman’s G&Ts to Hogarth’s 18th century paintings of vice, this is a city that has “a history” with the drink. I go for the fun updated take! 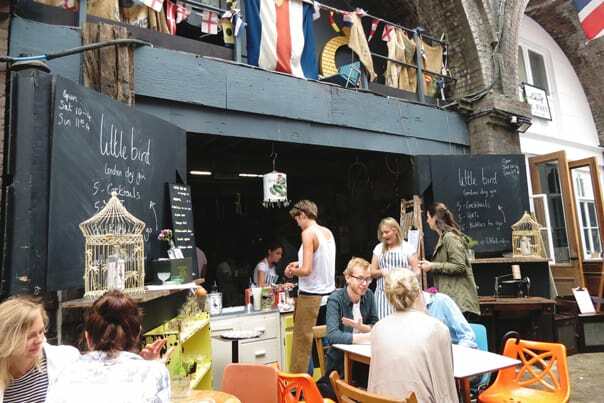 Also in Maltby Street, stop by Little Bird for a truly gorgeous G&T with their signature grapefruit. It’s a small-batch operation, but I’ve never known them to run dry. Sunday Market at Spitalfields — I could talk all day about Spitalfields (in fact I’ll come back to it in a bit), but stop by on Sundays for an amazing international extravaganza. Russian borscht, Canadian poutine, Ethiopian flatbread, Venezuelan arepas… you can chomp your way through whole continents here! The Table — If you’re on the south side of the Thames, near the Tate Modern or Shakespeare’s Globe Theatre, stop by The Table for a meal. But if you’re really dedicated, show up on the weekend for brunch. 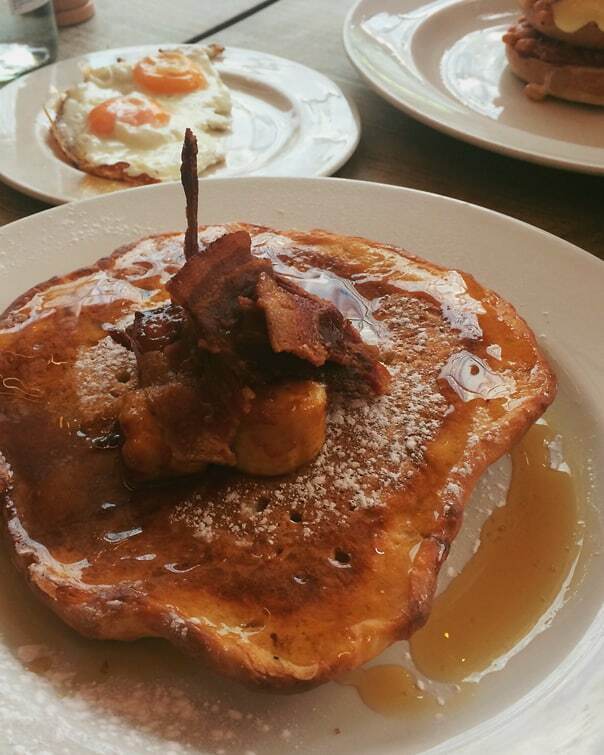 There are no reservations but the sweet corn fritters and British-style pancakes are a treat. V&A Café — Is it weird that I love museum food joints? Sorrynotsorry. The baked goods and teas are nice, nothing special, but the venue? To die for. Victorian decor with glorious chandeliers that will make your Instagram account happy. You’ll have to share table space with strangers, but enjoy it. Flat Iron Steak — No surprises here, they do steak. Beautifully. There are no reservations so wait times can get intense, but they are in a fun area of Soho so you’re free to wander while you wait for a table. When you get it, I strongly endorse the homemade horseradish sauce on the side, and definitely go for dessert — the caramel and sea salt mousse if you can. The Attendant — I mentioned wit, right? This coffee and food joint is housed in an old, Victorian public toilet that has been renovated while keeping much of the original design elements. 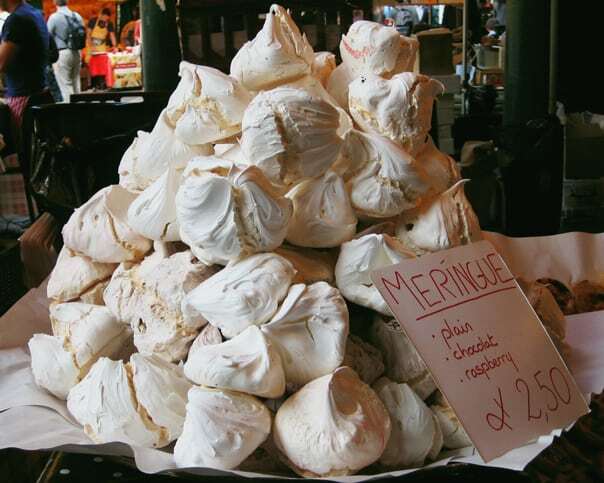 Borough Market — A foodie paradise, this market is celebrating its 1,000th birthday. It is crammed full of grocers and specialist food stalls selling everything from fresh bread to the world’s fanciest truffles. Portobello Road — The section at the top of the road where the entrance to the market may be the most famous for its antiques, but keep wandering down and you’ll find shops and stalls selling clothing, food, bric-à-brac and more. If you’re up for a decent walk, stop at number 282 Portobello Road, the site of one of my favorite vintage stores in all of London. The owner, Claudia, is a riot and will tell you stories about her adventures at various fashion weeks while finding you the perfect tweed jacket. Real Food Festival — Set up every weekend at the Southbank Centre, it’s one stop shopping for global street food. 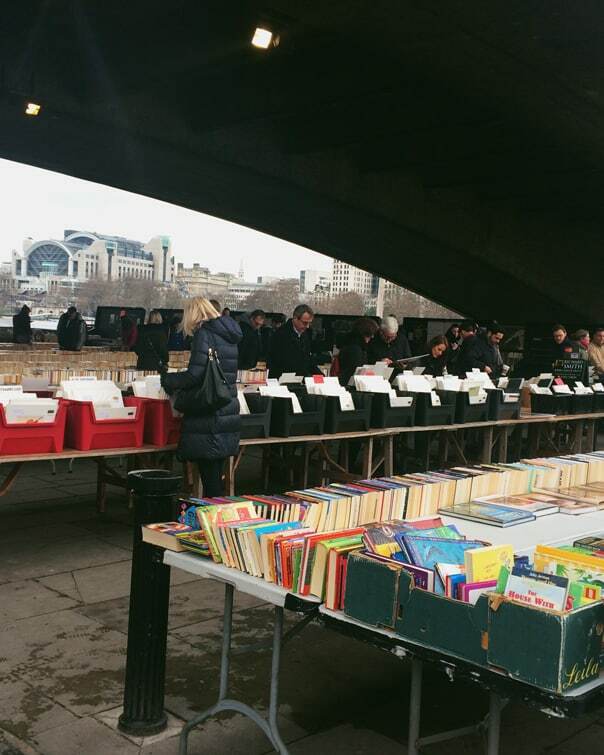 Southbank Centre Book Market — Nestled under Waterloo Bridge right alongside the Thames is a gem of a market. Each day tables are laid out and piled with books for buyers to peruse. Items like comic books, plays, maps and limited editions occasionally appear as well, so you can find some real prizes if you spend some time looking. Seven Dials — This area used to be a notorious slum (it featured in an Agatha Christie murder mystery due to its criminal reputation) but now it’s a collection of seven streets loaded with shops, cafés, theatres and goodness. If you can catch a show at the Donmar Warehouse theatre, definitely do. Neal’s Yard — Tucked away in Covent Garden, this semi-hidden yard is painted in bright colors and sports a number of shops and restaurants worth checking out. Spitalfields Market — Told you we’d be back. Spitalfields is home to a massive market worth checking out, but do yourself a favor and explore the SIDE markets that spring up around it, like Brick Lane. There are new sister markets and shops popping up all the time, and a recent one in a yard off Commercial Street has some excellent stalls for prime vintage shopping. The Berwick Street Cloth Shop — I’m not even close to fashionable, but London’s fashion industry feels very accessible to me. If you’re interested in textiles in any way, stop by to see this hub of design. Floris — This fragrance shop has been around longer than the United States, and sells some of the loveliest things you can imagine. It’s located on Jermyn Street, which is famous for men’s fashion throughout the last three centuries, and is just across the street from Fortnum and Mason, where you can get an excellent afternoon tea. 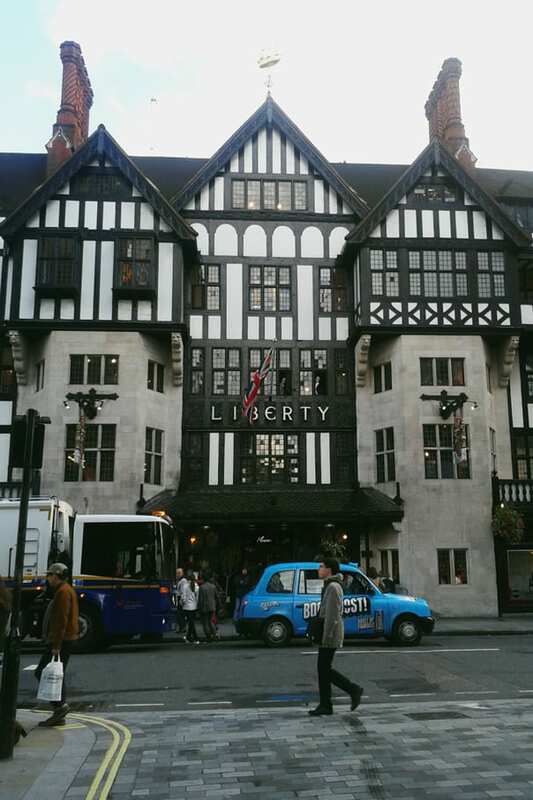 Liberty — One of London’s most iconic stores housed in one of its most iconic buildings. It might look like a Tudor relic, but it actually dates from the 1870s. Supplying everything from cosmetics, to jewelry, to fashion, the most eclectic of home goods, it’s a great place to pick up a gift or souvenir. The Design Museum Shop — The Design Museum is a small little gem and their shop sells smaller yet equally nice gems ranging from accessories to furnishings. Interesting and unique items, and the stock switches up regularly. Lovely and British — This adorable shop does exactly what it says on the tin. They stock only British-made goods with a heavy emphasis on decor and accessories. They lack a website, but don’t let that stop you from putting in a visit. Located on Bermondsey Street, there are a ton of similarly unique stores in the area that are worth checking out. Tatty Devine — Interesting jewelry in a gorgeous shop front. What more do you need to hear? Bloom — I’ve got a thing for fragrances and this shop features scents and perfumers that you cannot find anywhere else in Britain. I’ve had my eye on a gorgeous new scent for months and am just waiting to run out of my current bottle before I snap it up. If you want to feel (and smell) original, spend some time sniffing your way through the bottles. James Smith & Sons — It rains a lot in this country, so Smith & Sons have been arming Londoners against the wet for years. Nearly 200 in fact. They also make walking sticks, canes and… swordsticks. Seriously. Trips by car aren’t as big of a deal in the UK as the US, how you get around here is by train. And there are some delightful options! 1 hour by train: Cambridge, England — I’m partial to Cambridge because my family used to live in the area, but it’s a charming town in and of itself. The colleges that make up the famous Cambridge University are open to visitors (entrance fees included, but there are free events that allow you access without paying a penny so keep an eye out), and you can see a staggering amount of history in one place. Major scholars, politicians and artists ranging from Henry VIII to Charles Darwin have put their imprint here. And after taking in the culture, stop by Auntie’s Tea Shop for an afternoon cup of tea and traditional scone with cream. 4.5 hours by train: Edinburgh, Scotland — From medieval castles to the café where J.K. Rowling penned the first stages of Harry Potter, Edinburgh is a beautiful taste of southern Scotland and makes a fun day trip. If you want to inject some culture, head up during the Fringe Festival–one of the most renowned arts festivals in the world–to see street performers, plays, and musical acts. 3 hours by train: Paris, France — Grab your passport because Paris is less than 3 hours away by train underneath the English Channel! 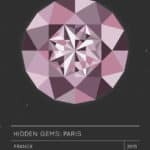 Step onto the Eurostar at King’s Cross and step off again at the Gare du Nord in the heart of the city. 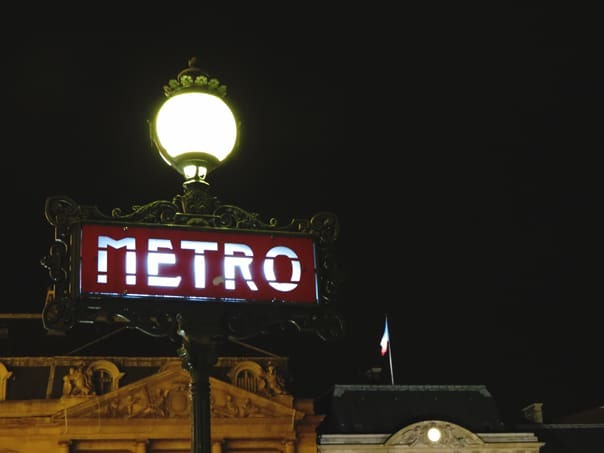 The metro is incredibly visitor friendly and all of the major sights are just a short ride away. You can do a day trip but for maximum exposure, I say plan a long weekend! 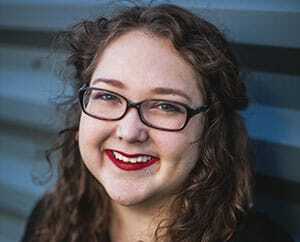 Cadence is a writer, marketer, reader, and eater living in London. Her work has appeared in LOOK Magazine, Red Magazine online, a number of sites, and her own blog, Small Dog Syndrome. 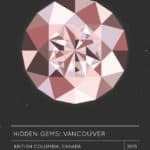 By day she is the marketing coordinator for a boutique, luxury development company, by night she explores the city with her husband, Jeff, and wrestles with a debut novel. 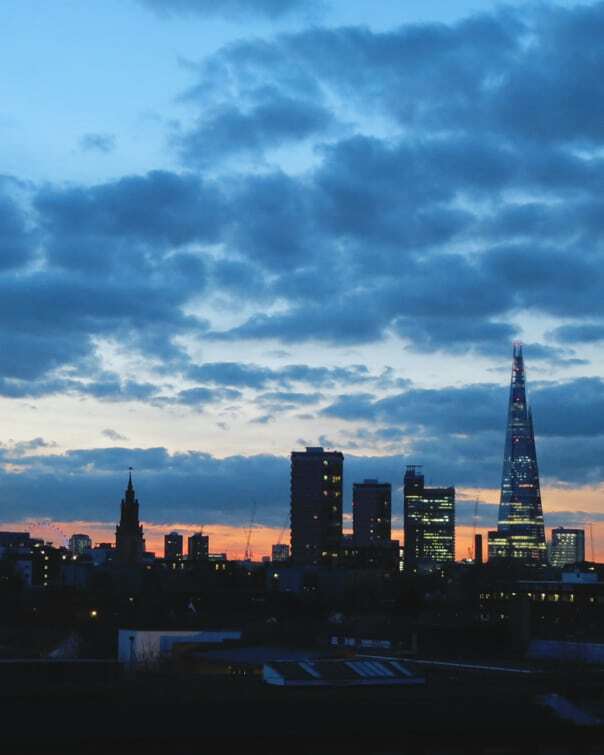 You can follow her on Instagram where she has an ongoing, unabashed love affair with London. Jeff doesn’t seem to mind. Yes! It’s always so fun to find hidden gems in big cities like this because there’s so much going on, and some of the little (but amazing!) places so often get overlooked!